After last week's disappointing performance in the loss to Watford, a big response was needed from Chris Hughton's men against last season's runners-up, who were visiting the Amex for the second time in just over four months. Davy Propper was voted the sponsors man of the match and controlled the midfield throughout the 90 minutes as he moved on from his sub-par performance at Vicarage Road where he went missing on occasions. Solly March also had a strong showing, both attacking wise and defensively. A lot of the post-match talk was focused on how poor United were, but Albion's strong pressing game forced Jose Mourinho's men into mistakes, and the Seagulls took their chances when they came. Deadline day signing Martin Montoya was thrown straight into the deep end as he deputised at right back following the injury to Bruno last week. His strong showing certainly put fans at ease as he contained the likes of Anthony Martial, Marcus Rashford and Juan Mata at times. Albion fans would have been concerned after seeing skipper Lewis Dunk forced off in the first half with an ankle injury, but Leon Balogun quickly suppressed those concerns with a dominant display beside Shane Duffy. The Nigerian international earned a well deserved round of applause after sprinting full speed past United talisman Romelu Lukaku to defend his lines. It seems that if Dunk does miss game time due to the injury, his position looks to be in safe hands with Balogun. 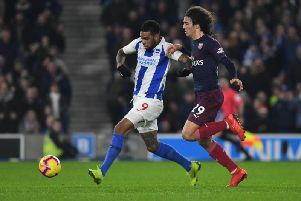 The injuries sustained to Bruno and Lewis Dunk could put strain on Hughton's defensive options, with Ezequiel Schelotto the man to miss out on a place in the 25-man squad, leaving Montoya as the only recognised right back, and deadline day signing Dan Burn out on loan to Wigan as he recovers from a broken bone in his foot. Bernardo's versatility was put to the test last week after moved from left back to right back in place of the injured Bruno, but the Watford attack caused plenty of problems in which the Brazilian struggled to deal with. Hughton did say in his pre-match press conference that he hopes Bruno will return to training at the end of this week, but news has yet to emerge on the severity of Dunk's injury, which he sustained after stretching to recover a loose ball. Excluding the full backs, the line up against Manchester United was the same as the one which succumbed to defeat at Vicarage Road. Gaetan Bong earned his first start of the season after featuring for over an hour last week, and Solly March retained his place on the left hand side. As the team news emerged there were ripples of frustration amongst the Albion fan base, who had expected to see potentially record signing Alireza Jahanbakhsh or Yves Bissouma in the starting line-up. But those who had expressed their disappointed were made to eat their words after solid performances all over the pitch. March claimed an assist as his early cross was cleverly tucked away by Glenn Murray to put the Seagulls ahead, before goals from Duffy and Gross put the game to bed. Out of all 34 goals scored last season, only one of those was scored by a defender, and Albion had to wait until March for that. This season though is a different story as Shane Duffy scored his first ever Premier League goal just two minutes after Murray had given the side the lead. His goal marked a strong performance from the Irishman, despite giving away a stoppage time penalty, as he was given Sky Sports' Man of the Match award after the game. Chris Hughton will be hoping that more of his players will be able to chip in on the score sheet this year, with centre midfield pairing Stephens and Propper also failing to get off the mark in the league. The victory over one of the top six sides in the league will act as a major confidence booster for the squad, especially as they next travel to Anfield. Albion chairman Tony Bloom has previously mentioned targeting points in away games against the top six, and Albion will be hoping to achieve that on Saturday. The Seagulls lost all six games away against the sides last campaign, scoring just a single goal, but managed to pick up seven points against them at the Amex.